46cm diameter steel ring with mounting plate. Official size and weight, nylon wound rubber ball. Complete with inflation adapter. 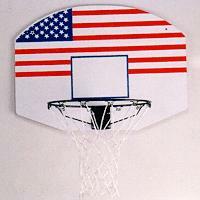 "Stars and Stripes" design, weatherproofed backboard with target area. Backboard (W) 79, (L) 58cm. Is pre-drilled for ring. Complete with instructions and fixings. fitness equipment, water sports & accessories, outdoor & indoor sports, sports bags, basketball etc.